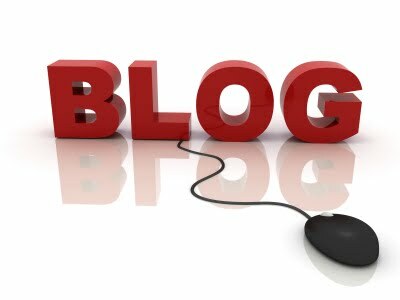 I have a number of blogs I look at everyday. And often that is all I do is look, not read. But there are a few that have the kind of content that always get my attention and keep me coming back for more. A new blog which looks like it will have me coming back for more is Chesha in Motion, written by Jessica. I met Jessica and her husband Jason while digging at Tel-Gezer in 2009. They are a delightful couple who are clearly very in love. Jessica and I had several opportunities to work and talk together (she was also the camp nurse and had to bandage me once or twice). We discovered that we had a lot of the same kind of thoughts. The ones that make you ask why, and sometimes get you in trouble with those who are afraid of questions. Well, now she is stepping out and putting those thoughts out there. So why not stop by and see what she has to say. Her first post is a thought provoking one on Divine Child Abuse. That should get you thinking! In the end, I return to where I began. I am glad that someone of Bell’s stature and impressive communication skills is taking the opportunity to broach these important questions. I am sure that many, many people think about these topics and ask these questions, at least quietly, on a daily basis. I think that Bell has tapped into some ideas here that should be explored. How do we understand the nature of God’s plan for salvation/restoration of creation? What about those who never hear about Jesus? Are they, can they be saved? Or what about those whose only encounter with Jesus has been the abusive, power leveraging Jesus that shows up in so many of our churches? If people meet and reject the wrong Jesus, can they still be saved if they never find the real Jesus? I realize that there are a lot of assumptions to unpack in these questions. But that is where one begins, by asking questions. What about what I call Bell’s inclusivist hope? I think there is some tension here for all of us. I am fairly convinced that the Bible is exclusive and not inclusive. But that does not mean I am not open to asking the questions. Is it possible that all of creation will be saved/restored? Of course it is possible. The belief in God as creator and sustainer of all things demands that I at least acknowledge it is possible. We do ourselves no favors when we create theological categories and definitions and then declare that God does and must act that way. I can almost hear a heavenly laugh when such arrogance is on display. The witness of the Bible, however, is of exclusivity. Consequently, I live in a tension with what the authors of the Bible say and what I hope will happen. I don’t think that makes me a Universalist or Inclusivist (I hate labels anyway). What it does make me is someone who lives in hope that everyone will see their life restored and healed. I think Jesus too was one who expressed much hope for creation. But I wish that Bell had been much more responsible with his use of scripture. There doesn’t seem to be much point in raising the questions if you aren’t going to do the work to support your answers. If he truly thinks that scripture is the place to begin to sort out these questions, then he should do so judiciously. I think Bell would have done himself and his readers a better service if he had written three or four books on the subject. Talk about a biblical view of heaven and hell and then bridge the gap between how the ancients thought and how we should apply it, but do it with sound exegesis. Challenge us to rethink about the nature of salvation and the degree to which it is inclusive or exclusive. But do it by bringing out the complexity of the idea within scripture. I suppose that my biggest complaint about this book is not everything that I have listed above. It is that Bell has done a more than rather poor job at probing and answering the questions and he has left himself open to countless, needless, charges. The result, I fear, will be that for several years now those who ask these questions will be seen through the “Love Wins” paradigm and will not have their questions answered. Worse yet, they will be excluded because they asked them. That would be a tragedy indeed. On the flipside, perhaps this will be the beginning of a serious, sober conversation about these topics that brings about new ways of thinking and living. I hope it is the latter. Yesterday I looked at what Bell has to say about Hell. Today I look at his hope for the salvation of all humanity. I suppose that there are few people today who have not at one time or another questioned the teachings of the Bible and the church when it comes to the topic of salvation. Who has not wondered or asked about those who have not ever been exposed to the Christian faith and then die? What happens to them? Indeed, even some of the Apostle Paul’s earliest converts asked similar questions. Some in the Thessalonian church had died before the return of Jesus and the survivors wondered if this meant that they had missed the resurrection (1 Thess 4). Paul writes to comfort them and let them know that death cannot get in the way of God’s plan for salvation. In “Love Wins,” Bell tries to layout a case that nothing can get in the way of God’s plan of salvation. A number of people have accused Bell of being a Universalist. This is not a fair charge since nowhere in the book does Bell spell this out. Those who charge Bell with being a Universalist need to read his book more carefully and do so with a theological primer lying next to them. Bell is an Inclusivist, not a Universalist. The differences are subtle, but important. A true Universalist, to be cliché, believes that all roads lead to God and accepts that all religions as valid. Inclusivism, however, holds that the work of Christ is the only means of salvation. But an Inclusivist allows that direct knowledge of Christ may not be required. It requires some sort of faith response to God that God in turn accepts. Now, in fairness to Bell, he also does not label himself explicitly as an inclusivist and I am not sure that he fits a textbook description of one, if such a definition exists. In reality, I think what Bell has expressed in the book is a hope that all people will be saved. I am not sure from what he says, however, that he is completely convinced that this will happen. Thus, I think he has an inclusivist hope, which I don’t think is in and of itself heterodox. After all, is not the nature of hope our desiring and longing after something that may or may not happen? Bell’s “inclusivist hopes” are based on his conviction the God’s love will eventually win over all. He supports his contention by appealing to New Testament passages (Matt 19; Acts 3; Col 1) that express “that God will ultimately restore everything and everybody.” He also mentions that such a hope is found in church history when he indicates that such luminaries as Clement of Alexandria, Origen, Gregory of Nyssa, Jerome, Basil and Augustine either believed in the reconciliation of all people or was aware that this was the belief among some (107-108). Like many others throughout church history he wonders how a loving God can send people away forever. His suggestion is that God does not and that this is a choice by the individual. God loves humans so much that he will give them exactly what they want. And if that is separation, then they will receive it (p. 116). Whether that separation is hell or not, he never really says. Again, I like the question but not the answer or at least the way he arrives there. For instance, Bell uses Revelation 21:25 in which the New Jerusalem is described as a place where the gates are never shut. Bell concludes that this image suggests that people are free to come and go. The gates don’t keep people in or shut people out (p. 115). But this overlooks the end of chapter 20 (not to mention the rest of Revelation) where there seems to be a clear dividing line between who is in and who is not. Even more explicit is Revelation 22:14-15 that identifies who is in and who is out. 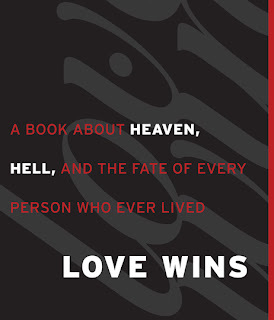 While Bell does open the door to allowing anyone from any religion into heaven, at the same time he challenges those who would say it doesn’t matter what you believe (p. 155). He states that what you believe does matter, and that Jesus is the only way of salvation. But he doesn’t say how that is worked our practically. He allows for different ways that people talk about “Jesus” and identify “Jesus” even if they don’t necessarily mean the Jesus of Christianity. He points out that there are those among us who reflect the life and teachings of Jesus better than those who claim to be followers of Jesus (p. 159). And that we need to be careful about making decisive judgments about people’s eternal salvation. I get what Bell is saying and identify with with him on many levels. But he is certainly not saying it clearly. Many of us have struggled with the idea that loved ones are in “hell” or “eternally lost.” We have a hard time reconciling a loving God who punishes eternally for a short life of sin and missteps. And we all wonder about the person who has never heard of Jesus. I am not willing to comment on the possible eternal destiny of anyone. I am more than open to the possibility that God will save those who have never heard the message. In fact, I am hopeful. I just wish that Bell would do the hard work and answer the questions based on that work. Tomorrow I will wrap this series up with some concluding thoughts. Yesterday I looked at Bell's exegesis in the book. Today I follow the same path by looking at the concept of hell that he lays out. In the book Bell questions the traditional concept of hell as a place where there is ongoing punishment. Indeed, he rightly questions the medieval images that have long played a part of popular teachings about hell. And he is not the first. C.S. Lewis in his book The Great Divorce plays with the concept of hell and describes it as a place in which people who have been selfish all of their life continue to live that way, in eternal, personal misery, separated from God and unable, for the most part, to accept God’s love. Even an Evangelical as popular and well respected as John Stott questioned the reality of hell and whether or not a loving God could/would send people there to suffer forever. Stott’s theology of God’s love did not allow for that and he so adopted annihilationism, the belief that sinners are destroyed rather than forced to suffer forever. It could be seen as a final merciful act of a loving God to those who will never accept that God. More recently, NT Wright has offered a more nuanced approach to understanding hell. He suggests that regardless of how one understands the nature of “hell,” that ultimately it is possible for people to reject God to the point that they are separated from God. Wright admits that he wishes he could arrive at a different conclusion, but that the witness of the New Testament does not allow another option (Surprised by Hope, 182-83). So Bell is not alone. And I don’t fault him for speculating and reevaluating our understanding of hell. What is problematic, however, is the way in which he too easily dismisses the biblical idea of hell as a an eternal destination for sinners where they are tormented. Again, I don’t have a problem with him doing this, but it is how he does it. Rather than use good exegesis and then ask important questions about the cosmology of the ancients and how that should or should not be understood today, Bell turns “hell” into a metaphoric experience here on earth (pp. 70-73). Let me say, I get what he is saying and agree. There are many, many people that are living in a personal hell every day. Some of their own making some because what others do to them. And I believe that we have a responsibility to help free these people from that hell. But this is all Bell talks about. It seems that he thinks by shifting from a few mentions of hell in the Bible to talking about pain, suffering and injustice in today’s world he can answer the question about hell. Again, I don’t fault him for questioning and reconceptualizing hell. But I wish he would start with good exegesis and then move forward. He seems to too easily dismiss the idea that the Bible suggests sinners will spend time in eternal torment (p. 92). But what he forgets or is unaware of is that the concept of hell in the Bible is drawn from the Jewish thought of Jesus’ day. For instance, a look at 1 Enoch 17-22, a book referenced by Jude (vv.14-15), will demonstrate the concept of a destination for sinners, one in which there is fire and torments, a place to wait for final judgment. It is well entrenched in the thought world of first century Judaism. When he turns Gehenna into a metaphorical place where you “send your garbage” (pp. 68-69) he demonstrates a lack of appreciation for the significant historical and cultic connections to that place that have more to do with its identity as a place of evil and torment than its supposed location as Jerusalem’s garbage dump. Another thing Bell does is questions the idea of “forever punishment”. He spends a bit of time looking at the Hebrew and Greek terms olam and aion. As Bell correctly points out, sometimes these terms are translated as “forever” in the Bible. Other times as “eternal” and sometimes it simply means “an age” or “period of time.” Bell uses this examination of terms to point out that the time aspects can be fuzzy. More importantly to our understanding of New Testament theology, believers are not waiting for eternal life to begin in the future; it starts now (pp. 31-33; 57-59). Yes, I agree with that. What Bell does not mention or has failed to grasp is that not only is the context surrounding the word important, but so is whether the term (and he focuses mainly on Greek aion) is in the singular or plural. The ancients were well aware of the various nuances of the word. Consequently, when they wanted to express an idea of a “period of time” or “an age” they used it in the singular. When they wanted to express the idea of timelessness, “eternity,” they used the plural form of the term. One other comment on Bell’s definition of aion. He notes that sometimes it could mean “a particular intensity of experience that transcends time” (p. 57). I am not aware of such a definition nor can I think of any examples that would suggest such. I am willing to see and consider some examples. However, Bell provides none. The only support he provides is an illustration of how one loses track of time when spending time with a lover. He offers no passage to support aion working this way in a particular context. All of this comes to a head when Bell begins to apply his understanding of aion to the concept of eternal punishment. He looks at Jesus’ story of the judgment and division of the sheep and the goats in Matthew 25:33-46 (p. 91). Bell focuses in on verse 46 and in particular Jesus’ statement about the destiny of the goats. Most translations, as Bell acknowledges, read “eternal punishment.” But he objects to this reading. He looks at the Greek word kolazo which is translated as “punishment” and notes that it is a horticulture term that can also mean “pruning.” He then interprets the aion term as “an intense period of time.” Thus, according to Bell, those who are sentenced to this fate are not being sent off to “eternal punishment,” but to an “intense experience of correction” (p. 91). In other words, there is no eternal punishment, but a chance for people to learn what they did not in life. There are multiple problems with Bell’s reading here. First, yes, one of the definitions of kolazo is pruning. But this is not a biblical definition and there is not one example of the term being used this way in the Bible. Bell has picked a meaning that suits him. Second, aion appears here in the plural, not the singular, which strongly suggests that Matthew had “eternity” in mind here and not “an intense period of time.” Third, there is an even more important point that Bell does not comment on. Jesus’ words about “eternal punishment” are followed by the phrase “life eternal,” which is what is given to the sheep. This is a deliberate parallelism that is intended to contrast the fate/destiny of the two people. If Bell’s interpretation is followed then one has to wonder if the righteous will only experience life for an “intense period of time” and then, like the goats, expect something else. Bell’s reading here, as with his reading of the Sodom and Gomorrah passages yesterday, is simply unsustainable. I applaud Bell for wanting to ask the hard questions about hell. I just wish he had done it. I wish he had taken the time to do some careful exegesis and then looked at the results. 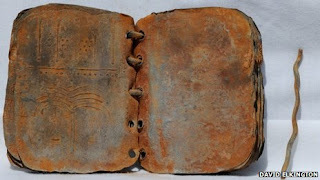 It may even be that he found the Bible did contradict his position. Fine. But at least acknowledge that and then explain why you question that particular teaching and/or why it may not apply to us in the modern age. Bell too quickly dismisses the biblical concept of hell and uses shoddy exegesis to prop up his conclusions. 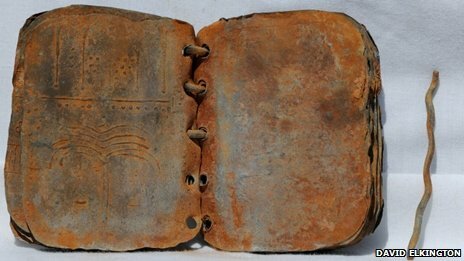 The BBC has an article on the recent announcement of the recently discovered lead books that I blogged about last week. The article offers this tantalizing statement. However, if you want to see some of the best pictures offered yet, check out this link to the BBC. One of my favorite quotes from Karl Barth comes neither from his Church Dogmatics nor his commentary on Romans. Instead, it is his farewell address to his students in 1935 as he prepared to depart Nazi Germany. “We have been studying cheerfully and seriously. As far as I was concerned it could have continued in that way, and I had already resigned myself to having my grave here by the Rhine! . . . And now the end has come. So listen to my piece of advice: exegesis, exegesis, and yet more exegesis! Keep to the Word, to the scripture that has been given to us” (Taken from the dedication page of Fee’s New Testament Exegesis). I start with this quote because this is an area in which Bell’s book has some serious deficiencies. He simply is not careful in the way that he uses scripture. At times he uses scripture to prop up his ideas in the same way that a school play will create a stage. From the front it all looks fine. There might be a few blemishes here and there, but for the most part it communicates the setting of the story. A quick glance, perhaps from a distance, could give you the impression that this is a first rate production put together by those who clearly know what they are doing. But upon closer inspection you notice that the set is held together by masking tape and coat hangers. A well-aimed kick at just one of the props and the whole set is in danger of collapsing on itself. The set the Rob Bell creates from the Bible looks “ok” and perhaps even “logical” with a quick glance from the distance. 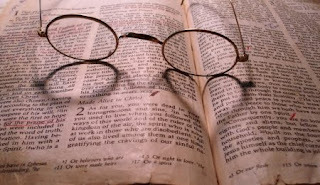 But the biggest hindrance to the way he reads scripture is his failure to observe context. Let me give you an example. A major theme that Bell notices in the Bible and promotes in the book is the restoration of creation. This is true. Much of the Bible communicates God’s desire/plan to renew/restore creation. The Apostle Paul writes in Romans 8 that creation looks forward to that day. But Bell has used this theme to launch into a teaching that much (all?) of humanity will be saved because restoration is “always” a part of God’s plan. But his exegesis to support this simply does not stand up to a well-aimed kick. For instance, on pp. 83-84 he rehearses the story of Abraham negotiating with God for the people of Sodom and Gomorrah (Gen 18). Bell notes that “for thousands of years ‘Sodom and Gomorrah’ have served as a warning, an ominous sign, of just what happens when God decides to judge swiftly and decisively” (p. 83). He then jumps to another mention of Sodom and Gomorrah in Ezekiel 16:53-57 which he quotes as “God will ‘restore the fortunes of Sodom and her daughters’ and they will ‘return to what they were before.’” Bell concludes that this means that the story of Sodom and Gomorrah is not over and that where there was destruction there will be restoration (p. 84). The problem, however, is that this is masking tape and coat hanger exegesis. Bell’s “quote” from Ezekiel is actually two phrases plucked from two different verses. It does not read as Bell has quoted it. Moreover, the context flies in the face of his reading. Ezekiel 16 is a pronouncement against Samaria in which God declares that Samaria has participated in and promoted evil to the extent that God will raise up Sodom and Gomorrah so that those two destroyed cities will be consoled about their own evil when they observe the evil of Samaria. This is not a promise of restoration, it is a rhetorical line of attack to demonstrate to the reader the extent of Samaria’s evil. Bell does not stop with Ezekiel 16, however. He next turns to Matthew 10 where Jesus is sending the disciples on a preaching tour. In 10:15 Jesus tells the disciples not to worry about those villages that reject them “for it will be more bearable for Sodom and Gomorrah on the day of judgment than for you.” Bell comments that Jesus is declaring these words in Matthew 10:15 to the village of Capernaum that was full of “highly committed, pious, religious people” (p. 84). This leads him to the conclusion that there is still hope for Sodom and Gomorrah and, therefore, there is hope for all the other Sodom and Gomorrah’s (p. 85). Two problems with Bell’s reading here. First, he has misread Matthew 10:15 and conflated it with Matthew 11:23. Capernaum is not compared to Sodom in 10:15, but is in 11:23. So right away his interpretation is the result of a careless reading. But even more perplexing is his conclusion. As in Ezekiel 16:53-57, Jesus is not holding hope and restoration for the people of Sodom and Gomorrah. On the contrary, Jesus is, like Ezekiel, saying that the evil of these other villages/cities is to such a degree that Sodom and Gomorrah’s crime seem almost trivial. It is almost as if God would have to raise up Sodom and Gomorrah and apologize to them if God did not respond to the evil of these other cities. Further undermining Bell’s, exegesis is the treatment of Sodom elsewhere in the New Testament. In 2 Peter 2:6 we read that God condemned those two cities to “extinction.” This does not sound like a promise of future restoration. Similarly, in Jude 7 we read that the destruction of Sodom and Gomorrah serve as an example to others of what God does to those who are evil. It simply cannot be supported in any way, from any of the scriptures that Bell quotes or doesn’t quote, that Sodom and Gomorrah is an example of God’s plan for restoring the creation. In reality, it serves to demonstrate just the opposite. Finally, adding to his unfortunate use of scripture, Bell moves from his conclusions about Sodom and Gomorrah to providing a string of scripture verses in which God has promised restoration, reconciliation and return. He is correct. These statements are there. But the context makes all the difference in the world. These promises are not for a generic people. They are made to a specific people, to Israel and Judah. God’s chosen covenantal people. To suggest that these are timeless promises, to all peoples, that refer to the possibility that ultimately all people will restored to God regardless of their obedience or lack of obedience to God (which is what Bell ultimately suggests p. 91) is just not sustainable. As I said in the introduction to this series, I commend Bell for asking some difficult questions. But I wish he had done his homework and done it well. He does himself and his readers a disservice by reading scripture in this way. Many of his scripture references that he is using to prop up his set are given without any reference to and or with any consideration of the context. The result is that one well-aimed kick topples the scenery. As Karl Barth said, exegesis, exegesis, and yet more exegesis! This is a topic I would not normally blog about. Bell’s book is of a more popular nature and my focus is usually on other areas. However, since the promotional video was released in late February followed by tweets declaring the end of Rob Bell, I knew that I would be asked by my some of my students and others for my opinion. Thus I thought it prudent, unlike many of those who criticized Bell prior to the book’s release, that I should at least read it and provide some feedback. So today begins a four or five part series looking at the book. While I may blog on others things here and there this week, this will be the focus for the week. I do want to mention one important disclaimer. What I do over the next few days is not intended to be a full blown review of Bell’s book. There is a lot in this book to discuss, too much for a one-off blog post. And as I will make clear at the end, that is one of the weaknesses of the book. In my opinion, Bell has bitten off more than he or his readers possibly can be expected to chew in one book (barely 200 pages long, some of which have as little as 150 words on a page). Much, much more can and should be said. I have three areas which I want to address as they relate to Bell’s book: exegesis, the concept of hell and the salvation of humanity. Beginning tomorrow, each one of these areas will be the focus of my daily blogging. But for today, before I begin engaging the book, let me lay out some of general thoughts about the questions Bell is asking and the controversy that his book has stirred. First of all, I appreciate the questions Bell is raising. I particularly appreciate that he is doing this in his role as pastor and finding a way to interact with those in the pew. Too often these difficult questions are not discussed in the church, but rather in the halls of universities and seminaries and rarely are the “laity” given a place at the table. Truth be told, many, many people in the pew have wondered about the nature of heaven and hell and if a loving God would really send someone to hell forever. The problem , however, is no space is made for these questions and in those rare times when someone does ask such questions they are usually shot down and, as in the case of Bell, threatened with the label of “heretic.” I am not sure when the asking of questions became a crime against orthodoxy, as in the case of a young pastor in North Carolina who lost his job for expressing his doubts and questions. My occupation requires that I ask such questions. If I don’t, I won’t learn. All of us should be allowed the space, time and freedom to ask questions. No matter how threatening they might appear to be. Let me also say that I don’t think that Rob Bell is a “heretic.” That word is thrown around too often without caution. When we label someone a “heretic” so quickly and easily we cheapen the word and gut it of its meaning. A similar example is found in the way some people throw around the labels “Nazi,” or “Hitler.” These are serious labels that are encoded with historical meaning and significance that should, by their very nature, be used sparingly. Those who are using this book as an opportunity to declare the end of Rob Bell and are gathering firewood for his pyre look more like the witch burners in Monty Python’s Holy Grail than serious inquisitors who want to interact honestly with hard questions. Finally, I stand in agreement with Bell and his critique of the modern “Gospel Message.” Too, too often the Gospel is sold as nothing more than fire insurance, an escape plan from the punishment and torments of Hell. In reality, as Bell points out, Jesus has much more to say about living a life for God here and now than he does about the possibility of what things look like on the other side. And that includes both heaven and hell. Much to our chagrin, there is more information in the Bible about what we are supposed to do and how we are expected to act now than about what we “get” or where we “go” once we die. Whatever I and others may identify as the shortcomings of Bell’s book, his attempt to make us think about living the Gospel now; the need to experience the kingdom of God here; is to be commended and given serious consideration. With that, I leave you till tomorrow when I will begin to look at the exegesis that Bell has used to answer the questions he is asking. The phrase "authority of scripture" can make Christian sense only if it is a shorthand for "the authority of the triune God, exercised somehow through scripture." N.T. Wright, Scripture and the Authority of God, p. 21.